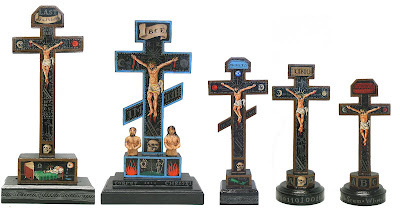 Five recently completed crucifixes. The tallest one on the left measures 300mm tall x 150mm wide by 70mm deep, just to give you an idea of the scale. From left to right: Last Kind Words (28th of Jan 2010), Corpus Christi (24th of Jan), Trinity (25th of Jan), One (26th of Jan) and Simplicity (27th of Jan). All completed this year. The Last Kind Words crucifix is based on an old blues song by Geeshie Wiley.